This was a very special members’ evening where we had the opportunity to learn from two of our most experienced photographers, Judy Wright and Ray Girling CPAGB . First of all, Judy took us back to basics with the first part of her talk entitled ‘Digital Photos Absolutely from Scratch’ and in her relaxed, gentle style she posed the question “What is a Digital Photo”? 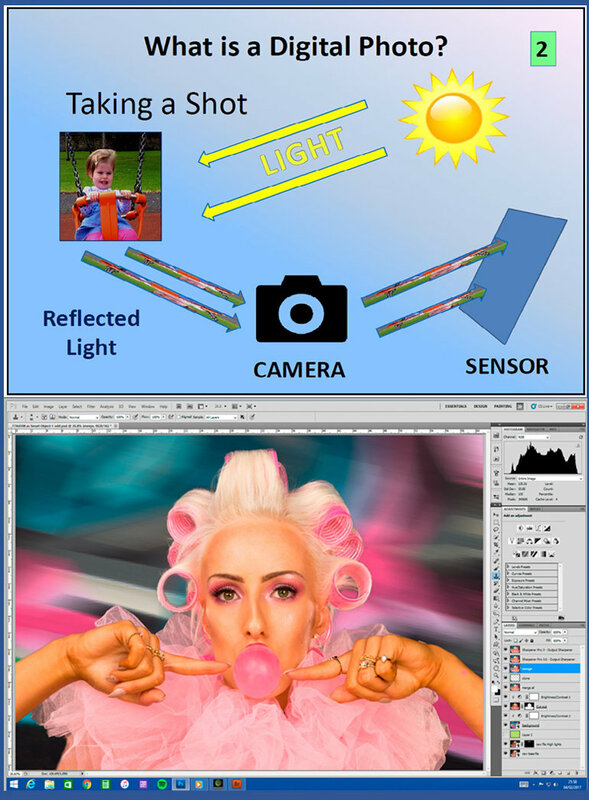 Using colourful, interactive on-screen graphics, Judy explained that digital photography relies on light and the human eye and brain to decide what the camera captures and how. Handling members’ questions as she went she talked about pixels, the size and shape of a digital file, jpegs vs Raw files, selecting colour profiles and the importance of correct re-sizing of the image for projection. After a short tea-break it was Ray’s turn in the tutor’s chair. He started at the opposite end from Judy of the digital photography process and everyone was keen to see how this master of post-processing would use Photoshop to turn a digital file into the image he wanted. Armed with his own computer and a selection of images he demonstrated his use of the Camera Raw window to set lens correction, adjust exposure to suit the shadows and highlights and correct white balance. Moving into Photoshop CS5, he then did a rough and ready cut-out demonstration using the quick selection tool and refine edge to create a layer mask. He tidied up hair, dropped in a different background which he then stretched and finally moved into NIK software to tweak the tonal contrast. Wow, such a lot of ground covered in just two hours! Chairman Ian thanked Judy and Ray for their demonstrations which take a lot of time and work to put together and the audience showed their appreciation with a good round of applause. We look forward to the next installment at the members’ evening on 8th March when we will be treated to more nuggets of information from Judy and Ray.